We left Madrid this morning at 0800 as scheduled. Cold, rainy day this morning and early afternoon. I would argue it was even “Colorado Cold.” Raining with 3 degrees Celsius. Given that our hotel was about 7 kilometers from the train station and we haven’t “officially” stated walking our Camino, I made a command decision to take the bus into town. The police officer at the train station was very friendly and informative as to which bus to take and when. It only cost us 1 Euro each for the 20 ride to the Plaza de Espana. The weather remained wet and cold. 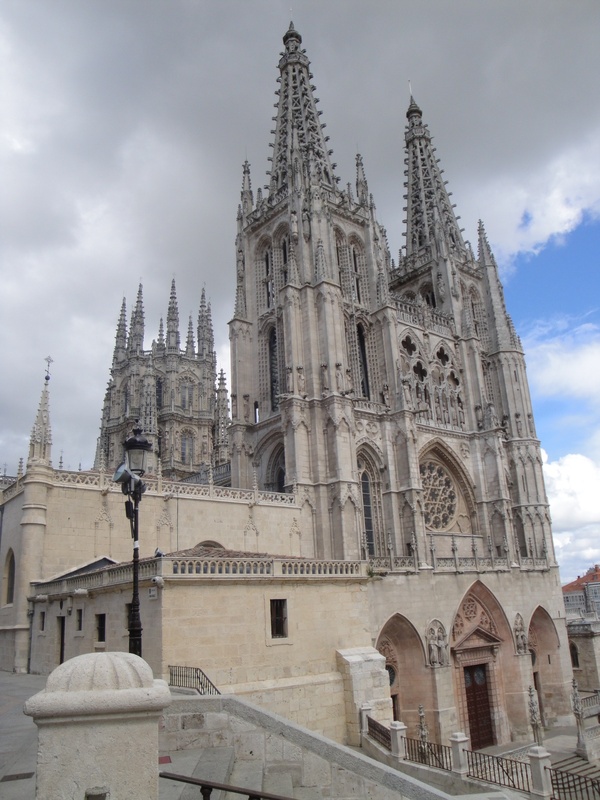 However, since we’re embodying the Camino Spirit, we walked around the old part of Burgos. It took me about 20 minutes to get my bearings and after that, it was easy getting around Burgos. We checked into our hotel then immediately went exploring after that. It didn’t take long to find our first pilgrims walking in town. They were a Canadian couple and she looked like she was in pain. They had started in St. Jean Pied du Port in France but had decided to take the bus to Leon. 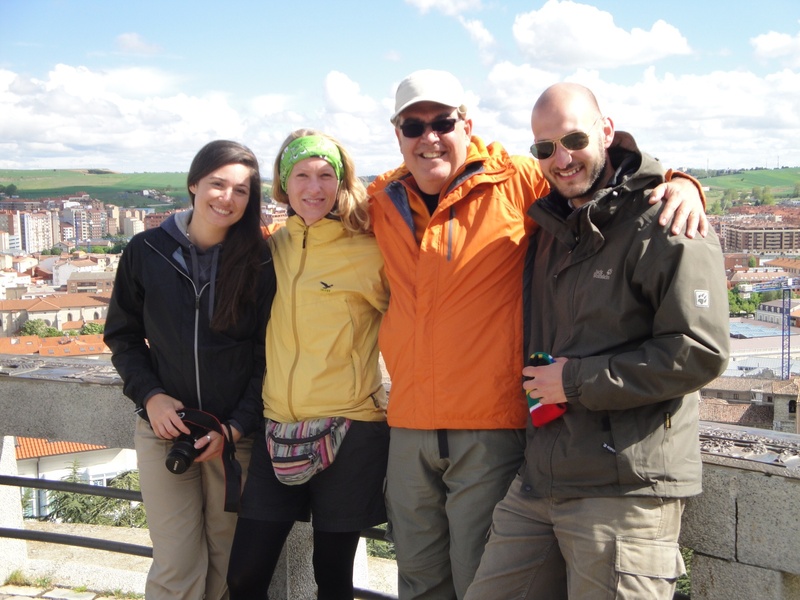 They said this apologetically but we reminded them that each of us are on our own Camino. If taking the bus to Leon helps them then that’s what they should do! We ate lunch in the Plaza Mayor. It was fabulous! 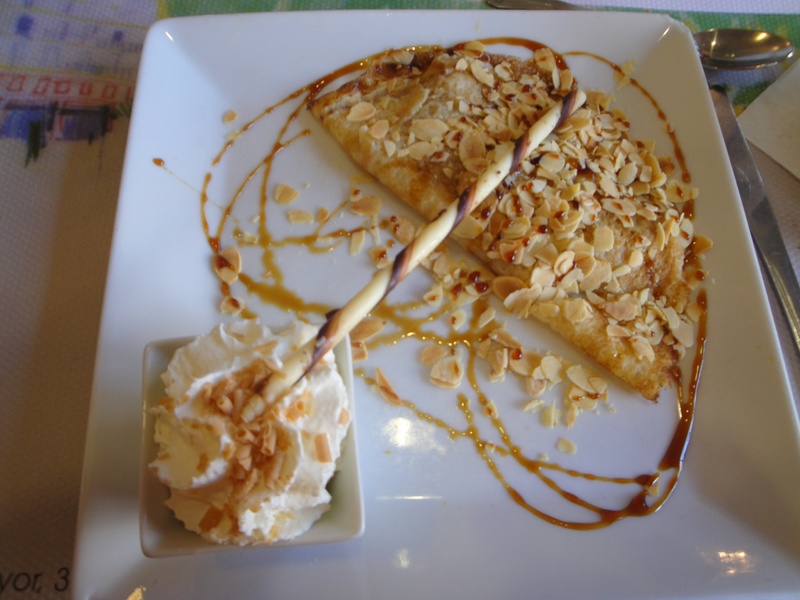 We had Paella Valenciana, vino tinto, then topped it off with a decadent Crepe Dulce “Argentino.” From there we went to visit the magnificent Cathedral of Saint Mary. It is one of the most beautiful and largest of Spain’s Cathedrals and that is saying something! Each of its 21 Chapels are incredible works of architecture and art. 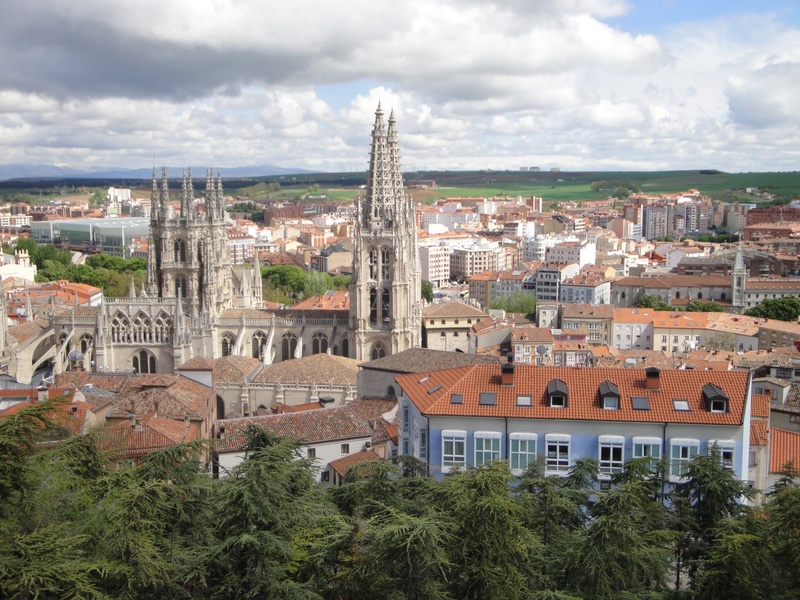 It is a “must see” when visiting Burgos. If you have already started your Camino and have your Pilgrim’s Credencial Passport stamped, you can enter at half price. Since we’re starting our pilgrimage in Burgos, we had to pay full price, 7 euros each. However, it’s easily worth it and we did get our first stamp or “sello” on our Credencial del Peregrino! From the Cathedral we started up a steep path to get to the Castillo overlooking the city. However, was closed. We did stop at a scenic overlook and took excellent pictures of the Cathedral and old part of the city below. While there we met two other pilgrims. Thomas from Germany and Claudia from Austria. Thomas is walking the Camino with his father. 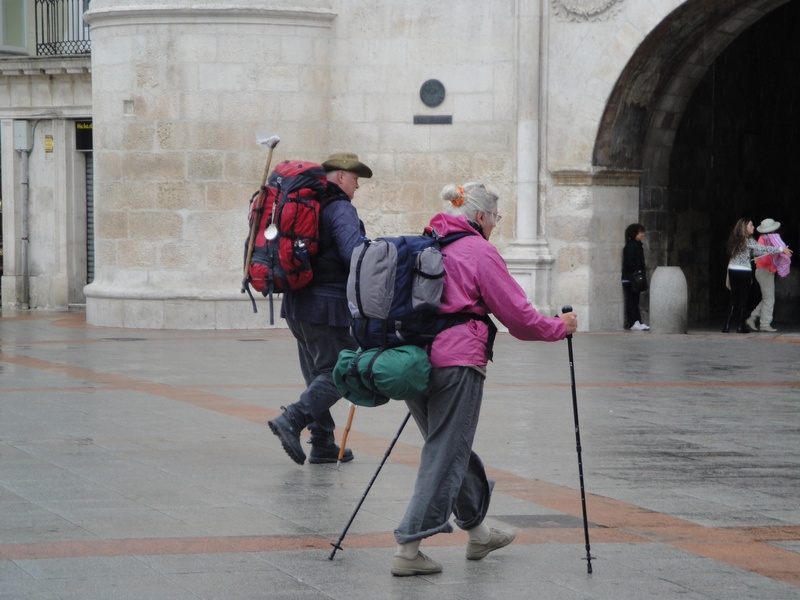 Claudia is walking the Camino with her mother! They met a few days ago. We enjoyed very much our visit with them. Thomas speaks excellent English. Claudia and her mother did the Camino last year though not together. They are both very friendly. Claudia has an easy smile and good sense of humor. We certainly hope to meet them again along the way. However, they’re very young and they resume their Camino tomorrow morning. They’ll have a day on us so the odds may not be in our favor. However, one never knows what the Camino brings! After the fun visit with our new fellow peregrinos we were ready for a late afternoon cafe con leche. We found the Ibanez Chocolateria on a very scenioc tree lined pedestrian mall. The homemade Chocolate cake was simply spectacular. The cafe con leche was the perfect compliment. A theme was developing for our first day in Burgos. 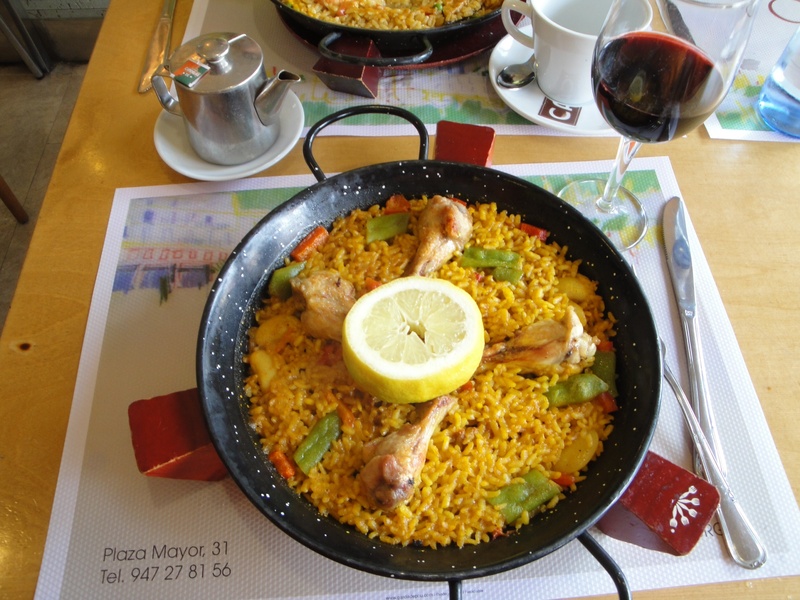 Delightfully friendly pilgrims and delicious food! Nancy said this evening she doesn’t want to leave Burgos! To top it off, we decided to find a market to buy bread, wine, cheese, serrano ham, and olives for a “light” meal in our hotel room. 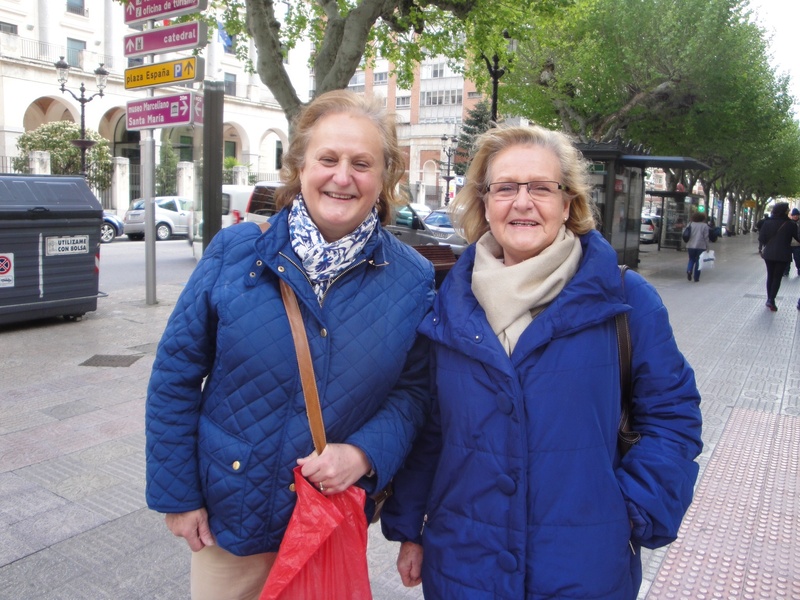 I asked two lovely Spanish ladies for directions to the nnearest market. They gave us excellent directions. They’re sisters. One has a daughter maarried to an Englishman. They live in London. She has another daughter who hhas been living in Wisconsin for 14 years. We plan to take a smail “training” hike to the outskirts of the western side of the city to visit an old monastery and pilgrim’s hospital that goes back to the beginning of the infrastructure that has developed over the centuries. Two Canadian pilgrims who are taking the bus to Leon. Two beautiful sisters of Burgos.